This week we welcomed the lovely Nikki to our Little Forest Folk team. A former teacher who has decided the fun of forest school and outdoor education totally outweighs the often huge amounts of time spent in schools on paperwork, Nikki has a great deal of experience to bring to the team. She's already making some firm friends in our children and we look forward to showing her more about the fun we get up to all day long in the coming weeks. Huge congratulations to Alena who this week passed her Forest School level 3 assessment - she's our newest expert in all things forest school and we look forward to sharing her latest ideas for fun and learning in our lovely site. Out in the forest it's been a changeable week. We've had torrential rain, we've had glorious sunshine....and amongst both we've had lots of laughter, giggles and smiling faces. For some of our younger charges this week we have been reading 'We're going on a bear hunt' and seeing them enjoy anticipating and filling in the story words before going off on real life bear hunts in exploration of our forest. 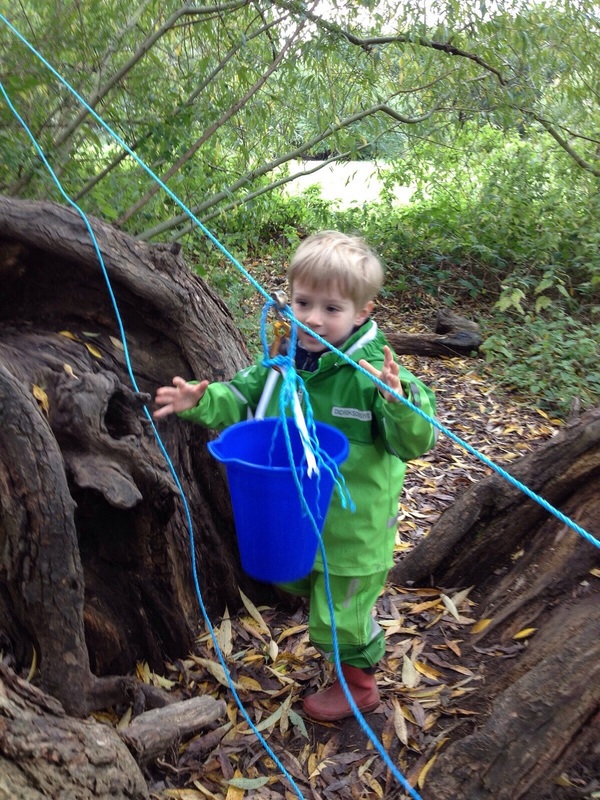 Given the children's recent fascination with our ropes, rope swings and rope play, we have this week extended their rope play by adding pulley systems to our forest. 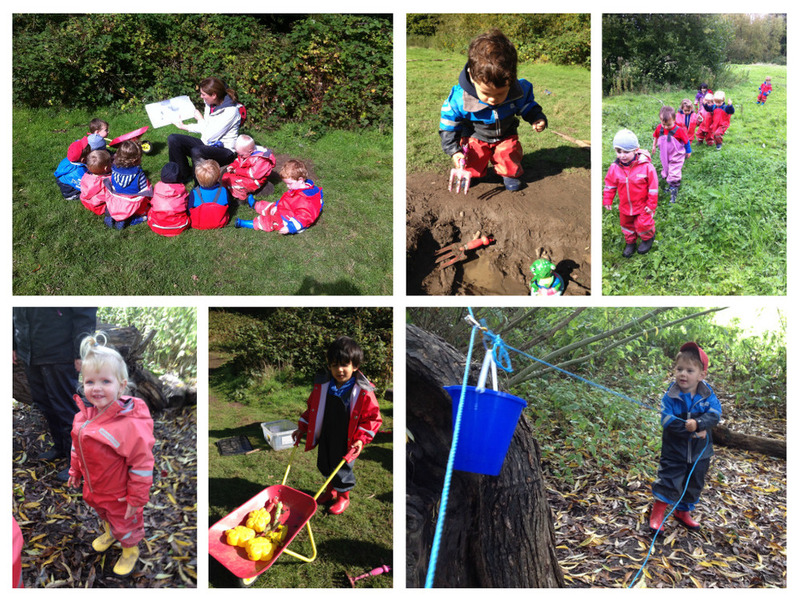 The children have been collecting leaves, dirt and anything else they find loose in the forest then have been using the buckets and the pulley systems to transport their treasures up, down and across. They've loved experimenting with the movement of the equipment and we look forward in time to explaining a little more to them the basic mechanics behind the transportation system. After the torrential rain earlier in the week we now once again have quite a respectable little mud kitchen......without us having to carry in the water every day! 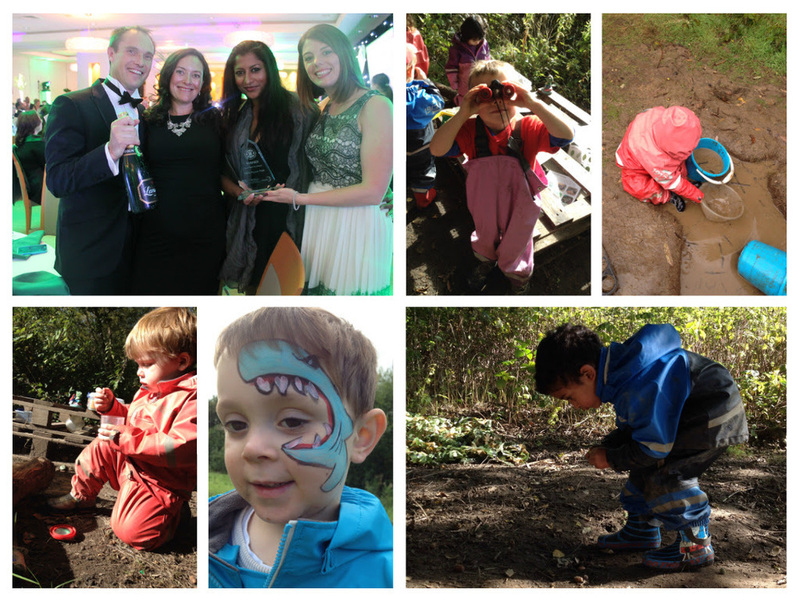 The children love the sensory feeling of squishing the mud and have been digging, burying and baking delicious concoctions in the mud kitchen all week. They seem to particularly like getting their wellies good and muddy in the kitchen! Lots of music and song in the forest with some of our new children particularly enjoying dancing. Lots of hokey cokey-ing and many other fun dance and songs. It may be time for Alena to bring her guitar out soon as live music can hold a particular fascination for children....if the weather holds! We've also discovered a hidden talent of Arturo's in face painting..... he can expect lots of pestering for his artistic talents quite frequently we think!